Never again will you wear hats on a plane because packing them is just TOO easy. 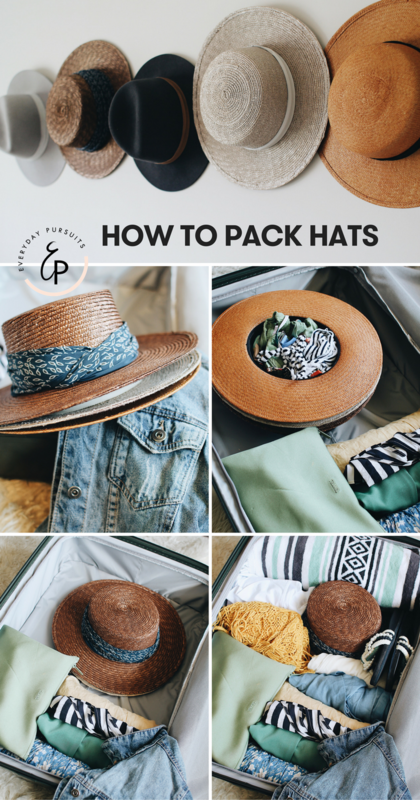 After many request on IG I put together something short and sweet that you can refer to when packing hats for your next vacay. Step 1. stack'em: start with the largest as the "main" one and stack smaller ones under it. Step 2. stuff 'em: fill the open space where your head would sit with clothing - bikinis and undies work best. Step 3. lay 'em flat: if for some reason the bottom of your suitcase isn't flat (handles run through it) then just fill in space with clothes to make sure the surface is pretty level. Always pack brim down. I stupidly did it the other way once and my hat was in shambles when I arrived at my destination. Step 4: pack 'em: pack clothing on TOP of the brim and all around the base but leave the top clear. There you go! Happy packing and traveling!